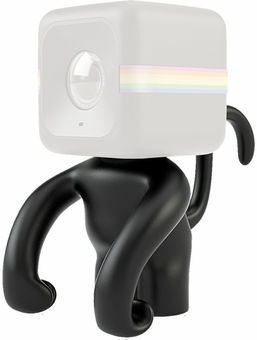 Apraksts angļu valodā: The black Monkey Stand from Polaroid provides a unique and fun may to mount your CUBE action camera. Taking the form of a monkey's body, the table-top stand features a built-in magnet on the top that mates with the magnetic on the bottom of the CUBE, allowing for quick and easy attachment. The magnetic attachment also allows you to position the camera to face to in any direction.